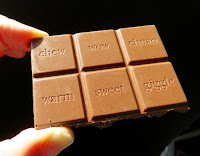 Hello and welcome to the first day of Chocolate Snacks Theme Week—an investigation of snack bars, confections, mixes, cookies, etc. that contain chocolate. 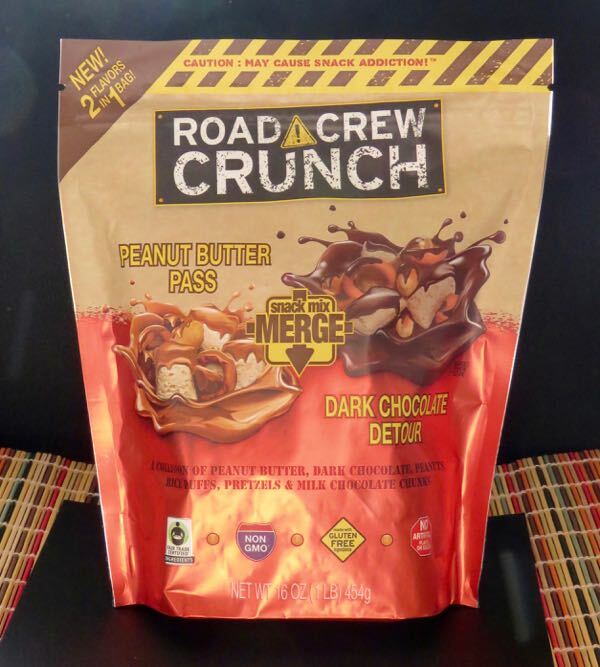 Today's Road Crew Crunch snack mix was a merge(r) of two different snack flavors: Peanut Butter Pass and Dark Chocolate Detour. Together, you had your choice of dark chocolate and/or milk chocolate covered, crunchy hunks containing peanuts, rice puffs and (gluten free) pretzels. The snack market in the U.S. covers a wide variety of packaged items, including healthy and "indulgent" snacks. 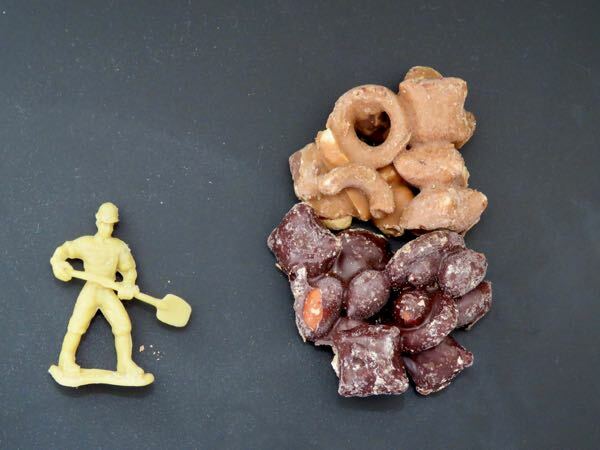 Annual total snack sales run in the billions of U.S. dollars. 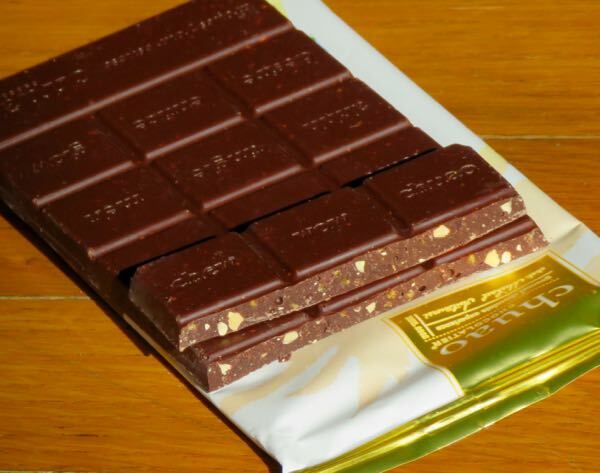 If each different chocolate item in the world had a different bar code, and the total number of bar codes were printed on a truck (one per semi-truck), the resulting line of connected transport vehicles would stretch 142 miles from the Earth (allowing the trucks to reach into space and back to Earth again with a few miles to spare). ** Granted, road construction in space is difficult; but you get the gist. It's starting to rain and snow here in the Golden State, which means more road repairs ahead. We love our cars in California and have thousands of miles of road (394,608*** lane miles in 2013) to maintain. 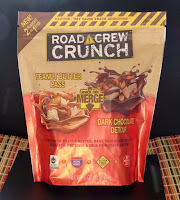 Today's Road Crew Crunch mix distributed by Rex's Outrageous, LLC (A Portfolio Company of Halen Brands Inc., Fairfield, NJ) might be a good, hearty snack for anyone outdoors doing road construction or other work. 75 ft. semi-truck + trailer x 10,000 (bar codes) = 750,000 feet, or 142 miles (228 km). (It's roughly 238,900 miles from the Earth to the Moon, but "only" 62 miles from the Earth to the beginning of "space."). 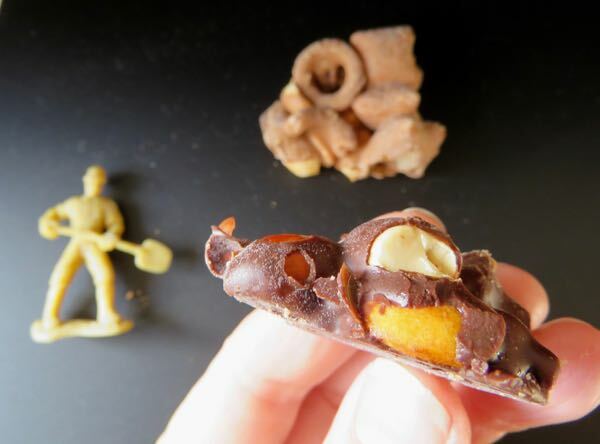 The short film "142 Miles from Monday" might be a better, more metaphorical analogy for Chocolate Banquet and Walking-the-Bay research projects. 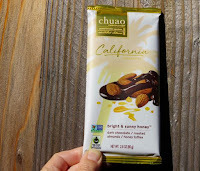 Welcome to Day #8 of Chocolate and California Dreaming Theme Week. 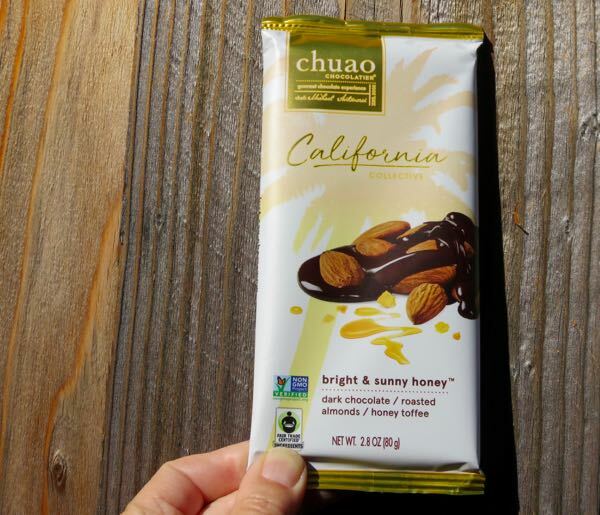 This Bright and Sunny Honey dark chocolate, California Collective* bar was from Chuao Chocolatier (Carlsbad, CA). Good name for this bar. 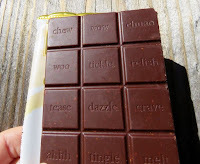 It really was, as far as dark chocolate goes, bright and sunny, thanks to the incorporation of tiny bits of honey toffee and roasted almonds. Happy winter sunshine and blue skies, to all those who have access to them today. And if you're trapped inside, this bar will bring a bit of Southern California sunshine indoors. *Chuao Chocolatier's Master Chocolatier and Chef, Michael Antonorsi, is living the California dream; and his recent California Collective collection of bars inspired by California living and flavors includes three bars featured in this week's theme week, and a few others. 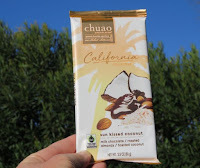 Welcome to Day #7 of Chocolate and California Dreaming Theme Week. Today's Sun Kissed Coconut milk chocolate bar from Chuao Chocolatier (Carlsbad, CA) was one of a series of California Collective bars from the company. The company's headquarters (Carlsbad) in Southern California (north of San Diego) is located in a lovely coastal area, near beaches, palm trees and southern California pastimes like surfing, paddle-boarding and swimming. Sounds like a California city that lives up to the dream. This Sun Kissed Coconut bar was made with tiny pieces of roasted almonds and flecks of toasted coconut. 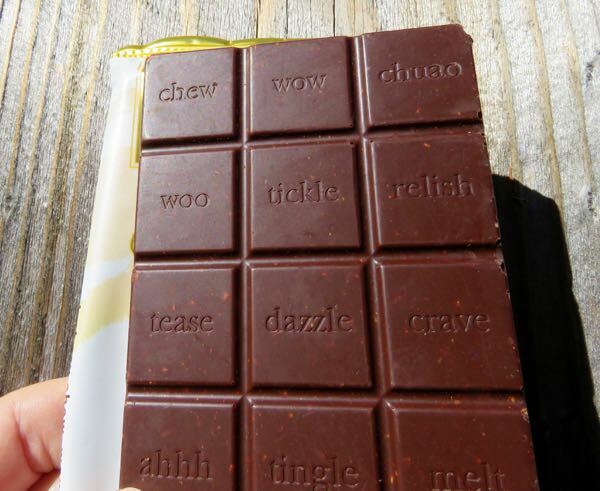 Its sweet, smooth milk chocolate coconut flavor and texture put it closer on the chocolate spectrum to a high-end confection than bar, but it was still enjoyable.